Medical interns all over the state of Maharashtra went on a hunger strike from 2nd of May, 2011. Today is Day 4 of the strike. 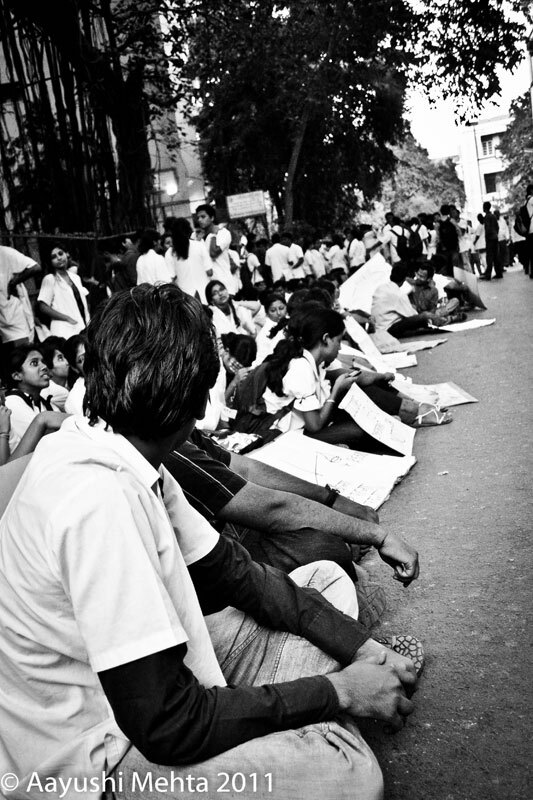 What started off with 24 medical interns and students on hunger strike from various medical colleges across the state, has intensified to now include about 114 interns on strike, of which 20 have been hospitalized. The demands? An increase in the monthly stipend of interns from the current Rs. 2550, to Rs. 13000. Maharashtra is the state in the country with the lowest interns' stipend, with other states offering much higher stipends (West Bengal - Rs. 14000, Jharkhand - Rs. 9000, Delhi - Rs. 13000, Assam - Rs.12500, UP and Bihar - Rs. 7000). as monthly stipend is a joke. Yes, agreed internship is a part of our medical education. But why the disparity in stipends across various states? Should we suffer because we chose to live/study in Maharashtra? The Government officials say that since medical education is sponsored by the Government, we cannot expect them to pay us a good stipend as well. But if we compare the fees during MBBS in every state, fees in Maharashtra are on the higher side, while the stipend is the lowest in the country. So if other State Governments can afford to educate their medical students and pay them a good stipend as well, are they suggesting that Maharashtra is the poorest state in the country that can't even support it's own health professionals? We know that cannot be true. As medical students we have studied for so many years, while our peers have started working and supporting their families, and now when we finally start working, at ages of 23-24, we still can't sustain ourselves with the measly pay we get (Rs. 85/day). In a city like Mumbai, where I live, that wouldn't even get me three square meals per day. And most of us still have years of studying ahead of us. 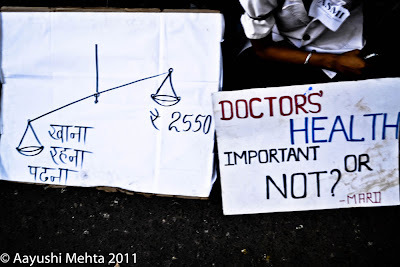 Seeing the state apathy towards the well-being of it's Doctors, there will be no wonder if the quality of health care services goes down the drain, if it hasn't already reached there. After repeated failed attempts to make the Government sit up and take notice these past few months, the interns were forced to go on a hunger strike. Even after that, the Government continues it's apathetic attitude. Since the last 4 days, interns have been sitting inside a pandal at the Kamgar Maidan opposite KEM hospital in Mumbai, on a hunger strike. No-one has even batted an eyelid. Media coverage has been lukewarm, political response has been almost non-existent, negotiations with the Government have yet to begin, and the interns who are not going hungry are so relieved to get a few days off from work that they don't even come to the grounds to show their support. Every evening, we are told that tomorrow there will be a meeting, and the issues will be resolved. Every evening means one more hungry night. I cannot even begin to think what the people who are going hungry must be going through. Today I am ashamed to be an Indian and a Maharashtrian, and disgusted and appalled by this state of affairs. To all my co-interns who haven't shown up to support the strike - You may not want these demands to be fulfilled, it may not matter to you, there may be more important things going on in your life, but many of your co-interns really need this change. An increase in the stipend would make a world of change to them, and to their families back home where they live in the villages of Maharashtra. If they can go hungry for days altogether to fight for what they deserve, can't you just show up and extend your support? If and when the stipend increases, are you not going to accept your increased monthly salary? Are you going to refuse the increased stipend, like you're now refusing to show up and fight for this cause? Is it not your duty towards your classmates and friends to support them in their cause? To the government officials - Well, I am sure none of them will be reading this, even if they are, I refuse to say anything to them. The strike should have spoken volumes, but since they haven't heard anything till now, I'm sure they're deaf. To the media - Please, just don't ignore us. Don't write a tiny article hidden inside your newspaper just mentioning our strike somewhere.We are not asking you to support our cause blindly, but go ahead, do your research, dig out the facts, and after that, if and when you realize that we deserve what we're asking for, then you can help us by creating awareness and increasing political pressure. The outcome of this strike will say a lot about this Government, and it will affect the state of health services in Maharashtra in the future, but more than that, more than anything else, the outcome of this strike will affect my faith and belief in my Nation and it's Democracy. Let's see where that goes from here. Good luck to you guys for this. Rs. 2500/month sounds awful for the amount of work you do!! Is there any particular reason for the disparities in pay across the country? How many days is the hunger strike? The govt is pathetic.. N it actually has the balls to tell us that interns don't do much work! I so wish such human beings came to the kamgaar maidan n see the protest with their very own eyes b4 I knock them senseless with a steel baseball bat! It's an indefinite strike till our demands are met. And of course, there is no particular reason for this, if there were any sensible reason we wouldn't need to go on strike! I understand and can easily relate with your cause but for once think of those innocent patients who might be suffering because of an indefinite strike. People praise and respect you as equivalent to God, so it's your duty to serve them earnestly. It's the apathy of our country that ministers gets bags full of money just to ruin and devastate the country. Yet, try to be logical and innovative. Instead of sitting on a hunger strike and making things worse for the common men, just join hands and say to the government that it's alright none of the intern would look after any affluent person or any rich guy. Then see the effect. Government will succumb to your demands. Rachit, what you are asking for us to do is nothing short of pulling off a miracle. The patients who we treat find it hard to even afford an OPD paper worth Rs.10. So there isn't any question of us refusing care to "affluent" patients, we hardly see any. We've made it so that the common man isn't inconvenienced by our strike. But, Rachit answer me this, if we continue to uphold the nobility of our profession, doesn't that make us soft targets for bureaucrats? Interns will be working for peanuts well into the 22nd century then! @Rachit: No affluent person in our country ever visits a Government hospital. Even people from the middle class like us never go there. So then, this idea is just not going to work. Let me assure you that no one is being inconvenienced by our strike except the Senior Doctors who have to bear our extra work load. The Senior Doctors don't even support our strike, expecting them to shell out money for us would be just unheard of! And you know, if at all the common man is affected by our strike, so be it. Maybe then they would realize that they need to support our cause. If we serve them everyday, don't they have some duties towards us as well? If the people supported us, the Government would listen to us much more easily. 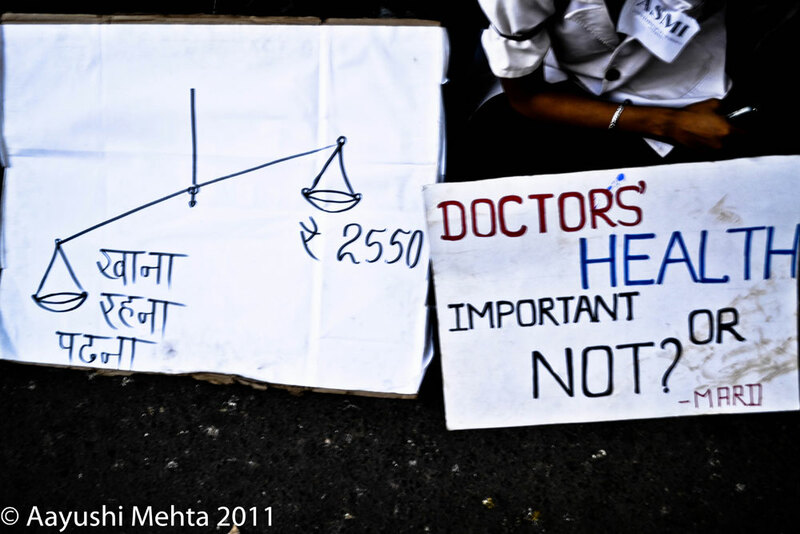 Just because we're Doctors, doesn't mean we're not humans with basic needs and families to support and futures to build. Instead of just calling us 'God', people should first respect us as fellow human beings and give us the dignity we deserve. one of the best blogs i ve read in a long tym !!!! tooo gud !! 2550??!!! In today's economy and with the inflation rate, are they kidding? No offense to anyone but the lady who helps me with housework makes thrice that per month. Medical interns work waaaaay harder than that and in far appalling conditions. I had to go to a governemnt hospital just once and those 15 minutes left me horrified and grossed out for the next few weeks. I already cannot imagine having to work in those conditions daily! Ayushi, I sincerely do hope your demands get met. Aayushi, it feels sad to read comments by people who know nothing about the circumstances in which we work, but those circumstances make us the person we become- doctors. The demand is justified, and is being considered by the government. Fingers crossed. By the way, you write well. I had goosebumps when I read this post! I'm being paid much better than this and I'm not even saving lives! Now, I'm feeling so damned bad!! All the best for your fight. I think you guys should go viral with your campaign. Use FB, Twitter....And write more such posts.... maybe you'll get more support. I Love B/W and Nice Human in the first one..